Margaret Holmes of blog.engineroomca.co.nz. 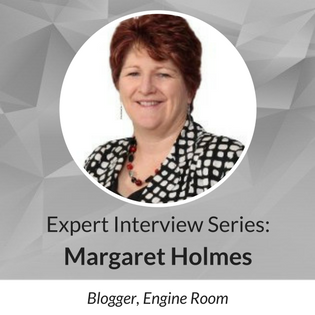 Margaret is a regular blogger on business strategies and cloud technologies. What’s the mission behind The Engine Room? How are you helping small and medium-sized business owners perform? The Engine Room team believes that small businesses are the driver of growth in local economies. We believe that every successful SME increases prosperity in our communities through increased profitability, greater employment and ultimately better social services. We work with individual business owners to achieve their business goals, whether that is improved profitability, better cash flow or a more balanced lifestyle. They learn what a financially well organized business looks like and what they need to do to achieve peak performance in their business. We utilize cloud technology to help SME’s systemize their business. Our own experience with cloud technology, implementing it within our business six years ago, enables us to identify the challenges and benefits for the business owner. From where you sit, what does great performance look like in a business? A great performing business generates surplus profits over a market salary for the owner, has cash surpluses and is reducing debt. Ultimately, a business that doesn’t require daily input from the owner to operate successfully is performing well and will give the business owner the lifestyle they were seeking when they were started. What are the common challenges or headaches you hear from the business owners you help? Why do they seek you out? The biggest challenge for most business owners is generating sufficient cash flow. The problems with cash often come from different causes but has the same outcome. We see business owners who are great at sales, but poor at invoicing and collecting money. Then there are the ones that are great at operations but don’t generate enough sales, and occasionally there are those that are great at understanding the profit and loss and think that moving the expenses around will solve the problem rather than focusing on selling or production. Business owners work with us because we take the time to understand what they do and what they want to achieve. We explain their financial information in the terms they use, so over time they understand the financial performance in their business and what drives it. Why do you advocate cloud computing for small- and medium-sized businesses? What are the advantages? Cloud technology has enabled SME’s to move from off-the-shelf, one-size-fits-all business management systems to building an ERP system that is right for their needs. The ability to utilize each system’s API to link them together means each business can have a best of breed solution. Most business owners are too embedded in the day-to-day management of their business. I would like to see them step away from their business regularly to think about where it is going and review what they are doing and why. If you only check how your business is performing once or twice a year your bank balance is your best indicator of success or failure. A good cloud based accounting solution like Xero, enables the business owner to see how the business is performing on a daily basis, as can their advisors. It leads to a much more proactive relationship but implementing a cloud system for the sake of it won’t solve fundamental problems with structure or management. Cloud technologies are just another tool in the toolkit for SMEs looking to understand and run a better business. What are the potential risks associated with using the Cloud for business? How can businesses safeguard themselves? I see two main risks around the cloud for SMEs – firstly, not understanding the benefits it brings and being slow to adopt the technology. Secondly, choosing the wrong solution. While there is always some security concerns, providers like XERO, QBO and MYOB have it a front of mind. In most cases your data is more secure in the cloud than on your desktop or laptop. Password security should be commonsense – make sure they are strong passwords and change them regularly. I do worry that some software providers are bootstrapping and that continued development is restricting by available funding. In saying that, none of the major players have disappeared. Businesses like Xero who have now been around for 10 years have ensured that the industry continues to attract investment. What considerations should businesses be making when selecting Cloud vendors? What are the most common mistakes or oversights you see brands making? There are lots of options for cloud software providers – the biggest risk is going through a full implementation with the wrong solution. While many solutions appear to be designed for DIY implementation, a lot of time and effort can be wasted by not approaching it correctly. DIY really only works for startups. How should businesses approach migrating different functions to the cloud? What are the dos and don’ts? For larger or more complex implementations the business owner needs to map their processes to see how they fit with the solution being considered. They should realize that no solution will perfectly match their current system. External expertise is well worth the money and can save a lot of heartache. We recommend that businesses don’t go all in at once. Define the outcome they are seeking, map the processes, select the solutions then implement one at a time. Provide ongoing training to the users throughout the process as you would with any change management. It is also important to remember that cloud software is constantly improving. Users need to take the time to keep up to date with changes as they can often save considerable time. What trends or innovations in small business technology are you following right now? Why do they interest you? I think we are on the cusp of some significant productivity gains – I am fascinated by AI and machine learning. In my own sector, we are seeing machine learning improving the accuracy of financial information already. I don’t see the technology making human intervention unnecessary but from a business advisor’s point of view it will enable us to spend more time on interpretation and advice and less on processing. This has to be good for SME’s – they will be getting much better value from their professional advisors.